The UKVIA is very excited to invite you to the exclusive launch of VApril 2019 in London’s glittering Leicester Square. Join the country’s leading vaping trade association and a very special guest to see what makes this year’s event bigger and better than ever. With presentations and masterclasses throughout the day, there really is something for everyone on VApril launch day. Don’t miss out on your chance to get the most exciting month of the vaping year off to the perfect start! San Francisco, already notorious for its opposition to tobacco harm reduction, has upped the stakes yet again as a city legislator pushes for a total ban on e-cig sales. 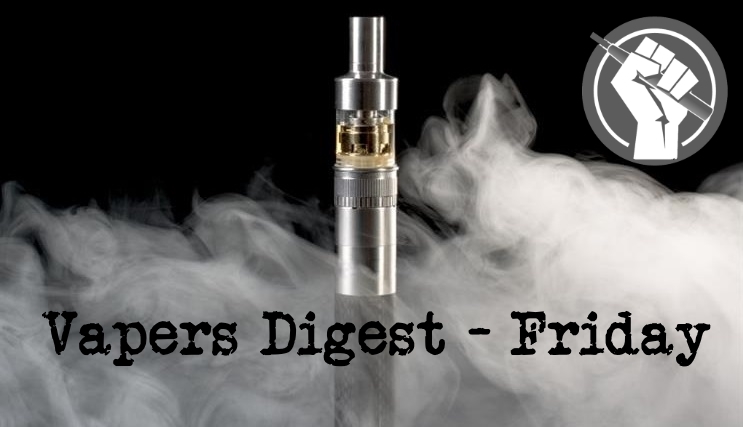 Similar anti-vaping laws continue to spread across the USA, although one Wisconsin town has decided to exempt vape shops from their workplace vaping ban – and the fact that’s seen as a victory tells us just how bad things are getting. There’s been a bigger win in India though, where Delhi’s High Court has frozen a national ban on vapour products. Steve Brine has resigned as Parliamentary Under Secretary of State (Public Health and Primary Care). He spent almost two years in the role and proved himself to be an excellent, knowledgeable advocate of vaping and tobacco harm reduction. The government has not announced his replacement as yet. The smoking policy at The University of Leeds used to treat vaping the same as smoked tobacco products. It has announced an updated policy that now acknowledges the statements made by Public Health England. Vaping is to treated separately and allowed on university grounds from August. Brad Rodu says the vaping ‘Epidemic’ doesn’t hold up to inspection. R Street Institute’s Marc Hyden argues that imposing taxes on vaping punishes people for improving their behaviour. Research says the last cigarette smoked in England will be in Derby. An article on Rice Media highlights Singapore’s hypocrisy in banning vaping. Paddy Costall, a trustee of the New Nicotine Alliance and director of Knowledge Action Change speaks to Regulator Watch about “die-hard tobacco controllers”. Language: All submissions must be in English, subtitled in English or English versioned. Rough/Fine Cuts: The Festival will only accept one cut of each film for programming consideration. If needed, GFN Film Festival will request an updated version and will contact those applicants directly. Restrictions: Films that are primarily promotional or commercial in nature will not be eligible for selection. Lately there’s been a lot of noise about a ”youth vaping epidemic.” I put that in “scare quotes” because it’s completely imaginary, there is no “youth vaping epidemic” at all; it’s been fabricated by Tobacco Control (as nearly everything they say is fabricated) – for a purpose: to coax vapers down one of Tobacco Control’s Slippery Slopes, by throwing kids under the bus to try and “save vaping” for adults – so that ultimately, Tobacco Control can throw vaping under the bus. And every time a vaper parrots Tobacco Control’s “kids shouldn’t vape,” that vaper is throwing kids under the bus, to appease Tobacco Control. Many well-meaning vapers do this, never realizing that they have been deliberately coaxed down that Slippery Slope by fascists with ulterior motives. San Francisco officials proposed the country’s first total e-cigarette ban citing public health justifications. However, what does it mean to ban something for the benefit of society’s well-being? There is no doubt that specific public health regulations are required to protect the population. From banning toxic materials in consumer goods to issuing mandatory occupational health guidelines, the public policy justifications of particular laws and regulations can indeed be warranted. Under the current trend toward global prohibition against lower-risk nicotine products like e-cigarettes and vapes, there is a viable case for questioning what constitutes a public health ban. Somewhere along the line, I must have gone astray. During my master’s in public health program, I was taught that one major goal of public health is to educate the public about the risks of various exposures. I was also taught that accurately communicating these risks, as well as helping the public to accurately understand the relative risks between different hazardous behaviors or products was critical. We just got the first clear evidence..
E-cigarette company Juul is on a quest to prove that its sleek devices can help smokers take up a healthier habit. Now, for the first time since its products debuted four years ago with the tagline “smoking evolved,” the company has published evidence that some adult smokers may be using the device to wean themselves off regular cigarettes. Christopher Russell, the study’s lead author and a psychologist at the Scotland-based research consulting firm CSUR, believes it shows the Juul can be used to quit. Vaping brand Juul has pulled its products from 16 stores that failed to uphold its strict Challenge 25 policy. The premises are all specialist vape stores and Juul made the decision to stop supplying them in the last few weeks after they failed mystery shopping tests carried out by Serve Legal. The US brand, which launched in the UK last July, is adamant that it will not supply retailers that cannot prove they enforce the Challenge 25 criteria in order to prevent sales to under-18s. As California lawmakers consider whether a ban on flavored tobacco would prevent teens from using e-cigarettes, a newly released study found that vaping could be an effective way to help teens and young adults quit smoking. The study, by the independent nonprofit Pacific Institute for Research and Evaluation, was published in the peer-reviewed journal Nicotine & Tobacco Research. A rise in teen vaping has created a frenzy within the U.S. Food and Drug Administration, as well as in state legislatures across the country. Just last week, San Francisco introduced legislation to ban the sale of e-cigarettes until the FDA conducts a full review of the product. Lost in the panic, however, has been a conversation about addiction. We don’t want to encourage bad habits among teens, but we must ensure our policies on e-cigarettes don’t make it harder for addicted adult smokers to quit. The wonderful worlds of Disney are now officially smoke-free. Smoking — and vaping — are both banned starting May 1, the company unceremoniously announced Thursday in a blog post. The news was buried in the eighth paragraph of a new “Know Before You Go” list targeted at moms. The new ban includes Walt Disney World and Disneyland theme parks, water parks, ESPN Wide World of Sports Complex and the Downtown Disney District in California. Anti-vaping groups are suing the FDA to push the agency to enforce its original deadline for all vaping products to go through premarket review. The original deadline was Aug. 8, 2018. Seven organizations and five individual pediatricians filed a lawsuit in the Maryland U.S. District Court, claiming that the FDA’s four-year postponement of the due date for filing premarket tobacco applications (PMTA’s) exceeded its authority under the Family Smoking Prevention and Tobacco Control Act. ATHRA Chairman, Associate Professor Colin Mendelsohn from the School of Public Health and Community Medicine at the University of New South Wales, says the House of Representatives committee report on e-cigarettes and personal vaporisers, tabled today (1) was a huge disappointment for those believing in evidence-based public health policy.